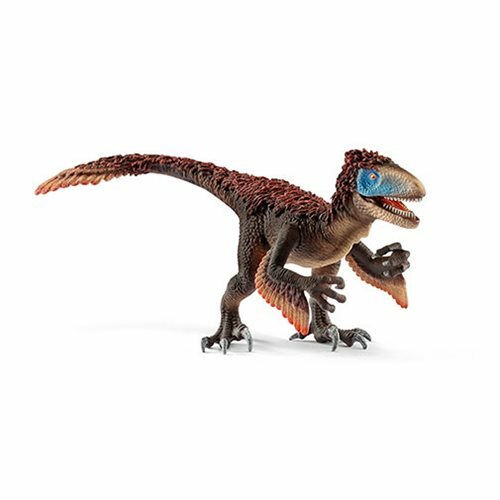 In extraordinary detail, this terrific Schleich Dinosaur Utahraptor Collectible Figure presents the Utahraptor, a fast, agile raptor that liked to hunt herbivorous (plant-eating) dinosaurs. You'll note the second toe of its hind foot has an unusually long, crescent-shaped claw that probably helped the Utahraptor hold on to its prey. You'll want to hold on to this 8-inch long x 3 7/10-inch tall version of the monster, because it's very cool, features movable arms, and comes with an informative booklet!